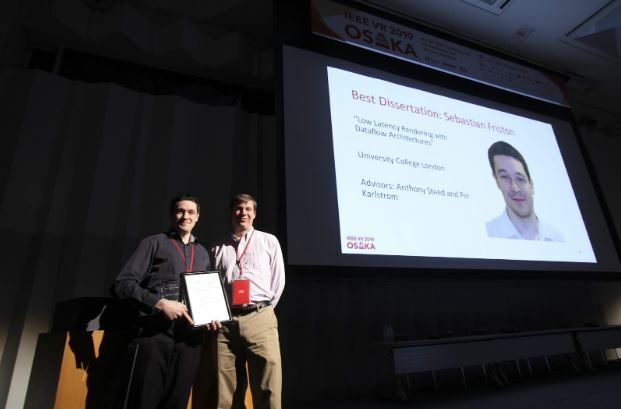 The 2018 VGTC Virtual Reality Best Dissertation Award goes to Sebastian Friston, a 2017 graduate from University College London, for his dissertation entitled, “Low Latency Rendering with Dataflow Architectures.” Sebastian is currently a Research Associate in the Virtual Environments and Computer Graphics Group at University College London. He completed his EngD under the supervision of Prof. Anthony Steed and Dr. Per Karlstrom, in collaboration with Maxeler Technologies Ltd. His dissertation addresses the problem of low latency virtual reality, investigating the application of novel computing architectures to image generation and the effects of low latency on human interaction. 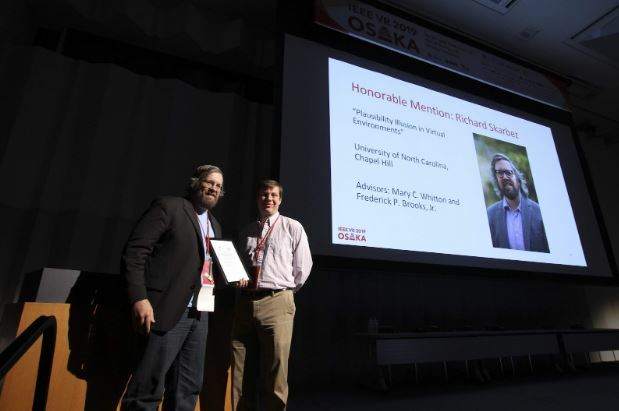 The 2018 VGTC Virtual Reality Best Dissertation Honorable Mention goes to Richard Skarbez, a 2017 graduate from the University of North Carolina, Chapel Hill, for his dissertation entitled, “Plausibility Illusion in Virtual Environments.” Rick is currently a Lecturer in Interactive Visualization at La Trobe University. He completed his Ph.D. under the supervision of Mary C. Whitton and Frederick P. Brooks, Jr. Dr. Skarbez’s dissertation investigated Plausibility Illusion, or Psi, in the context of virtual environments. The IEEE VGTC Virtual Reality Best Dissertation Award was established in 2016. This award is given every year to the author of the best doctoral dissertation in the broad field of virtual reality, defended within the preceding two calendar years. Eligible nominees for the 2018 award included the authors of all relevant dissertations defended between January 1, 2016 and December 31, 2017. A total of nine nominations were received by the IEEE VR Best Dissertation awards committee and were carefully reviewed by a panel of nine leading experts in the field. Each dissertation was read in full by three panel members and after an initial binning process, the top-ranked dissertations were subsequently read (or re-read) by all panelists to determine the winner. The IEEE Visualization and Graphics Technical Committee and the IEEE VR Steering Committee are pleased to solicit nominations for the 2019 Best Dissertation Award in the broad field of Virtual and Augmented Reality. One award will be given each year, and the recipient will receive complimentary registration to the IEEE Virtual Reality Conference, where they will be invited to make a short presentation. This award is given every year to the author of the best doctoral dissertation in the broad field of virtual reality, defended within the preceding two calendar years. Eligible nominees for the 2019 award include the authors of all relevant dissertations defended between January 1, 2017 and December 31, 2018. Resubmissions of unsuccessful nominations from prior years are welcome, as long as the dissertation defense date remains within the period of eligibility. If the dissertation defense date and the dissertation filing date are sufficiently different as to create ambiguity in determining the appropriate start of the period of eligibility for the dissertation to be considered for this award, the candidate may elect for their work to be classified as belonging to the period they prefer; however once defined this determination cannot be changed, so that no work may be considered more than twice. There is no limit on the number of nominations that can be made for candidates affiliated with any single institution or advisor. All nominations will be carefully reviewed by a committee of experts, selected by a representative from the IEEE VR Steering Committee. Factors that will be considered when choosing the winning entry include: the significance and impact of the technical contributions of the work, and the clarity with which these contributions are communicated.